Hello Guys!! If you’ve been wondering about my whereabouts, relax. I’m very much here. Had been under the weather a bit over the past week or so and therefore cooking and blogging did take a backseat. As much as we love the rains here in Mumbai, they have this uncanny knack of making you ill. I’m better now and back with some fabulous recipes for you. In other (very good and exciting) news, The Tummy Tale has been nominated for the “Indian Blogger Awards 2013”. Do take a moment and check this link for more details. While I was unwell, I was confined to having food that was bland and so so high on the ‘i-like-that’ quotient. So, after almost a week of illness and boredom, we decided that it was time for some celebration. The brief from the taste queens was that it had to be something light and fresh. One of the things I managed to purchase on my trip to the market was a huge bunch of cilantro which also happened to be my eureka moment. I decided to make th Dhania Murgh. Now, Cilantro or Corriander as it is popularly called is a well known herb and requires little introduction. Cilantrohas mild flavour and is usually used as garnishing. 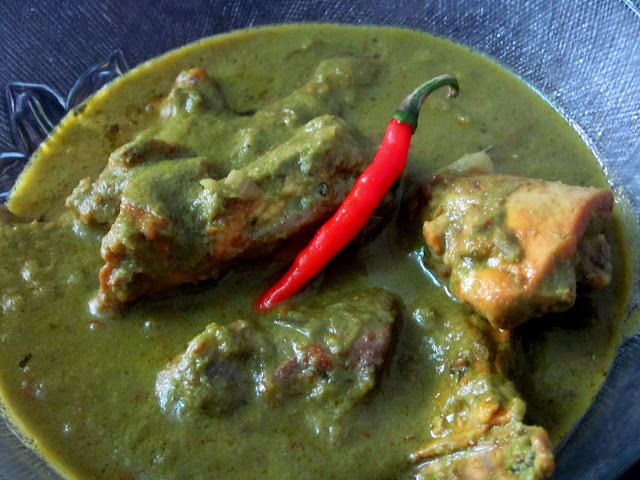 Everyone at somepoint has seen generous amounts of corriander leaves covering gravies, biryanis and even pulaos, however, the subtle aroma and flavour can be made into a gravy that taste equally good. Even if you prefer spicy food, my recommendation is not to use a whole ot of spices as it would tend to overpower the gentleness of the cilantro. Wash the chicken, pat it dry and then marinate it with the lemon juice, turmeric and 2 teaspoons of red chilli powder for about 2 hours. Heat 1 teaspoon of oil in a pan and toss in all ingredients mentioned under 'grind to a paste' except for the groundnuts. Fry for about a minute. Allow it to cool, then grind to a fine paste along with some water and don't forget to add the groundnuts. Heat 2 teaspoons of oil in a pan and lightly fry the chicken pieces on a medium flame till the chicken gets a light golden char around the meat. This should take about 3 minutes. Remove and keep aside. Save the marinade for later use. Now, in the same oil add the cumin seeds and crushed pepper and allow to crackle. Once the spices are sizzling, add the onion and the finely chopped cilantro leaves. Stir well till onions are pink and translucent. Add in the green paste and red chilli powder and the remaining marinade. Reduce heat and saute for about 5 minutes. Don't overdo this as you may lose the gentle aroma of the cilantro. Now add the tomato puree and saute for a bit till you see the oil leaving the sides. Add the chicken pieces and toss well to combine. At this point, you may need to add some water to suit your desired gravy consistency. Add salt and mix. Cover and cook for about 5 more minutes. Garnish with ginger juliennes and serve hot.